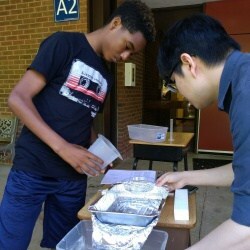 Students experiment with water runoff solutions at Walker School. Walker Upper Elementary School students participated in a pilot program with UVA Curry School of Education & Human Development that combines computer science and engineering to study how water runoff affects playgrounds. During the 2017-18 school year, fifth and sixth grade students tested a series of 18 lessons created by a collaborative team of UVA faculty, researchers and Walker teachers. Students had to use a variety of computer models and experiments to solve water runoff problems for pretend playgrounds they designed, as well as Walker School’s real playground. According to a March 29, 2019 article posted online by UVAToday, UVA is working with teams from Vanderbilt and SRI International to develop this curriculum as a way to meet growing state and national standards of learning that require integrating more computer science into classrooms. Breen, Audrey. “Local Students Pilot New UVA Curriculum Combining Computers, Rain and Playgrounds.” UVAToday, 29 Mar. 2019, news.virginia.edu/content/local-students-pilot-new-uva-curriculum-combining-computers-rain-and-playgrounds.